Board Chairman Stephen B. Gebeloff, Esquire, was born in Glen Ridge, New Jersey. He graduated from Binghamton University with a BA in Political Science and earned a law degree from the University of Pittsburgh. He was admitted to the New Jersey and Pennsylvania Bars in 1988, and The Florida Bar in 2004. 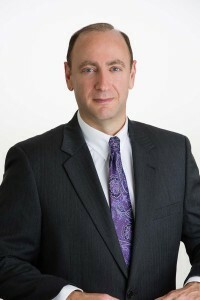 Mr. Gebeloff, founder of The Gebeloff Law Group, with offices in Boca Raton, is an experienced litigator whose primary areas of practice are commercial law, creditors’ rights, and construction law. He has represented clients from the banking, insurance, advertising, manufacturing, transportation, leasing, telecommunications, and service industries. Mr. Gebeloff is an accomplished saxophonist. He is entering his eighth season performing with the Symphonic Band of the Palm Beaches – having served for several years on its board of directors. He is a charity runner, running for the Palm Beach County Chapter of the Leukemia and Lymphoma Society. Mr. Gebeloff has completed several marathons and holds a Black Belt in Tae-Kwon Do.